Glutinous Rice with Coconut Topping – a kind of ‘dry’ rice pudding made from glutinous rice & coconut milk. It is cooked by steaming. The dessert rice is topped with fresh grated coconut sweetened with palm sugar. 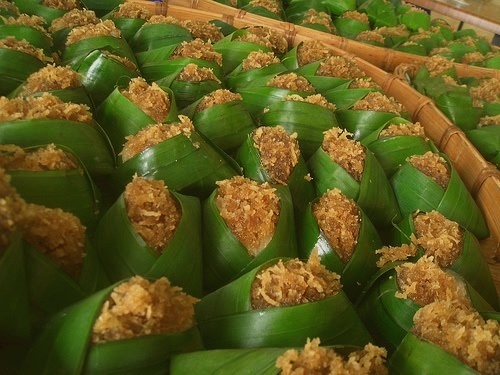 It is traditionally wrapped in banana leaves folded into a pyramid shape. Fresh banana leaves are traditionally used to package the dessert and are usually served on banana leaves. If banana leaves are unavailable, serve in a dessert bowl or plate: Spoon a portion of glutinous rice and top with coconut filling.